OpenKey, the industry standard for universal mobile key in hotels, expects to build on an impressive 2018 performance by reaching a key milestone in 2019. Following a 970 percent increase in keys issued among OpenKey client hotels last year, OpenKey is projecting performance to reach 100,000 mobile keys a month in 2019. An OpenKey survey, Guest Expectations for Hotel Tech in 2019, identified that technology will play a major role in the overall guest experience this year. Particularly, it found that 54 percent of hotel guests now expect mobile keyless entry. Given the convenience of having secure room keys directly on their smartphone devices, as well as the time it saves guests during check-in and check-out, this finding is in line with other research conducted in the hospitality industry. As more hotel properties seek ways to improve the guest stay experience, mobile key technology is a simple and cost-effective choice for 2019. “We are excited about the year ahead and the opportunity to accelerate our mission of revolutionizing room access in hotels. In 2018 we took major steps to build a stronger foundation for the path ahead that will allow us to make our technology more widely available. We augmented our strategic partnerships with leading property management system providers, industry organizations and are collaborating with new hotel portfolios, brands and properties all around the world,” said TJ Person, OpenKey CEO. One of the company’s 2018 innovations included the development of Automated Mobile Key Delivery. The innovative feature integrates with a PMS to issue a secure encrypted mobile key to a guest’s smartphone immediately upon hotel check-in. OpenKey’s proprietary technology makes the back-end delivery of mobile keys even faster and more efficient for hoteliers. 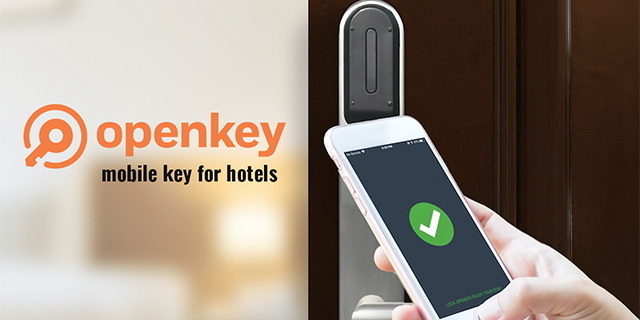 In addition to providing the most secure form of room access, the OpenKey app allows hotel guests to check-in and out remotely, receive room assignments in advance, get directions to and from the hotel, receive hotel Wi-Fi access information and much more. OpenKey also uniquely offers key sharing, a major app innovation where the main hotel guest can digitally share their mobile key with other guests without ever having to visit the front desk. OpenKey can be found in 50 countries on six continents with primary offices in Plano, Texas and Shanghai, China. The innovative key technology works with 90 percent of all digital hotel locks and is both user-friendly and affordable. To learn more about OpenKey, visit www.openkey.co.